Brown Gold, 100% Columbian Coffee - K-Cup DEAL!! 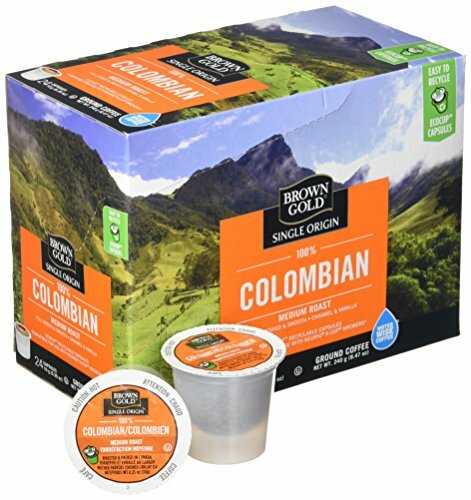 Home Amazon Brown Gold, 100% Columbian Coffee – K-Cup DEAL!! Brown Gold, 100% Columbian Coffee – K-Cup DEAL!! Need a Coffee K-Cups Deal on Amazon? Hurry and get the Brown Gold, 100% Columbian Coffee, 24 Single Serve RealCups today for as low as $5.78 (24¢ per cup!) from Amazon when you choose Subscribe & Save with at least 5 subscriptions! There is no commitment with Subscribe & Save. You can cancel at any time! Plus, get free shipping!! Details here! Save up to 15% on reorders when you subscribe to 5 or more subscriptions in one month. If you prefer one-time purchase, pay $6.80 (28¢ per cup). Amazon Prime members get FREE 2-day shipping! If you are not a Prime member, get FREE shipping when you purchase $25 or more of eligible items across any product category. Brown Gold is committed to making a difference at Origin. Over the next 3 years, we will invest to fund projects that will filter & clean the water so that people coffee growing origins can enjoy clean water. At Brown Gold we use only the highest quality single origin coffee beans for our coffee. Buy the Brown Gold, 100% Columbian Coffee, 24 Single Serve RealCups from Amazon.